MagTech™ Magnesium Drink Mix delivers a delicious dose of three of the most beneficial types of magnesium for human health: L-Threonate, Taurate, and Glycinate. Currently available in natural lemonade flavor, MagTech™ drink mix is suitable for any diet, contains zero sugar, artificial ingredients, colors, flavors, or additives. MagTech™ mixes smoothly with your beverage of choice--hot or cold-- and can be enjoyed at anytime of day. Packaged in convenient single-serving stick packs, you can enjoy the benefits of magnesium anywhere you go. 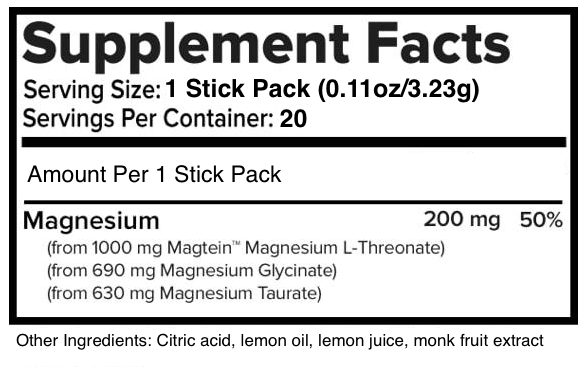 MagTein™ is a breakthrough super-mineral with strong evidence of supporting cognitive functions and brain health. It is the only magnesium compound that has been shown to effectively raise the brain’s magnesium levels, which leads to improved memory and cognitive functions. Magnesium Taurate is a synergistic combination of magnesium and taurate, a free-form amino acid. It’s known to decrease anxiety, relieve muscle fatigue, and promote a stronger immune system. This form of magnesium supports maximum absorption in the cells and distribution throughout the body. Magnesium and glycine both have a calming effect on the brain, helping to reduce stress and increase sleep quality. Restful sleep is important for the restoration of energy stores in brain cells depleted during a full day of thinking. Mix 1 Stick Pack of MagTech™ powder with 6 oz of hot or cold water. Take 2 servings per day, preferably in the afternoon and evening.